O seu estilo renascentista italiano faz destaca a Catedral da cidade, era a antiga igreja real e continua activa tanto como lugar de culto como museu. Para visitar o seu interior parecia que se pagava no entanto era hora da missa o que faz com que se possa entrar sem pagar, limitando ao mesmo tempo a possibilidade de ver com mais detalhe. É possível igualmente subir até á cúpula e ter uma boa vista sobre a cidade. 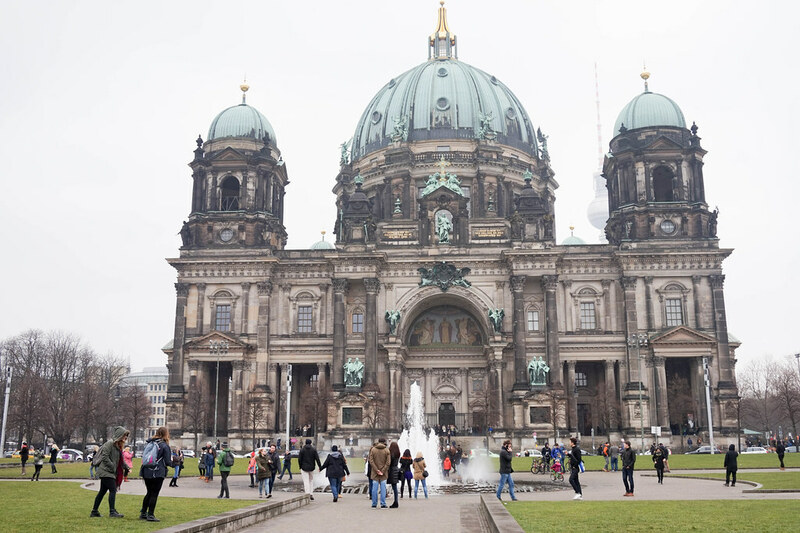 Its Italian renaissance style highlights the city’s Cathedral, it was the old royal church and remains as active as a place of worship as a museum. To visit its interior seemed to be paid, however it was time for the mass which makes it possible to enter without paying, limiting at the same time the possibility of seeing in more detail. You can also climb up to the dome and have a good view of the city. Foi o segundo lugar que visitámos no nosso Food Tour e é considerado um dos melhores Currywurst da cidade, daqueles onde se fazem fila. Obstáculo que conseguimos ultrapassar por ir exactamente no tour e provámos fora de pé a sua salsicha com o famoso molho que procura respeitar o original de Herta Heuwer de 1949. Não somos os grandes especialistas no assunto, a guia dizia que era um dos lugares favoritos de quem realmente aprecia a receita. It was the second place we visited on our Food Tour and is considered to be one of the best currywurst in the city, from the queue. Obstacle that we managed to overcome by going exactly on the tour and we tasted out their sausage with the famous sauce that seeks to respect the original Herta Heuwer of 1949. We are not the great experts in the subject, the guide said it was one of who really appreciates the recipe. Inserido no Tiergarten, foi inaugurado em 2012 para prestar homenagem ás vitimas do Holocausto de Porajmos durante a Segunda Guerra Mundial. Os ciganos foram perseguidos pelos nazis nesta época e tal como os judeus foram vitimas do genocidio. O monumento em si é bastante simples, está protegido por um muro de vidro e arvoredo, nesse mesmo muro está a cronologia da história das familias ciganas perseguidas. 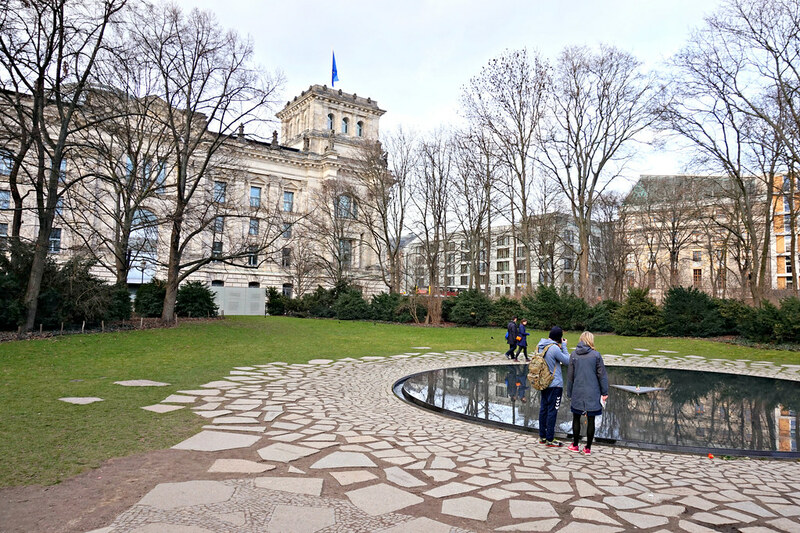 Inserted in the Tiergarten, it was inaugurated in 2012 to pay homage to the victims of the Holocaust of Porajmos during World War II. Gypsies were persecuted by the Nazis at this time and just as Jews were victims of genocide. The monument itself is quite simple, it is protected by a glass wall and grove, in this same wall is the chronology of the history of persecuted Gypsy families. Fomos a Berlim na época da Páscoa, a pesar de não ver tantos sinais dela como noutras ciudades alemãs ou de fronteira pensei que as barraquinhas de madeira que vi na Alexanderplatz eram por isso. Ao parecer estão sempre ali pelo menos algumas o que dá um contraste interessante á praça com o seu relógio mundial e edificios modernos á volta, esses pequenos toques do mais tradicional alemão ajuda a complementá-la. 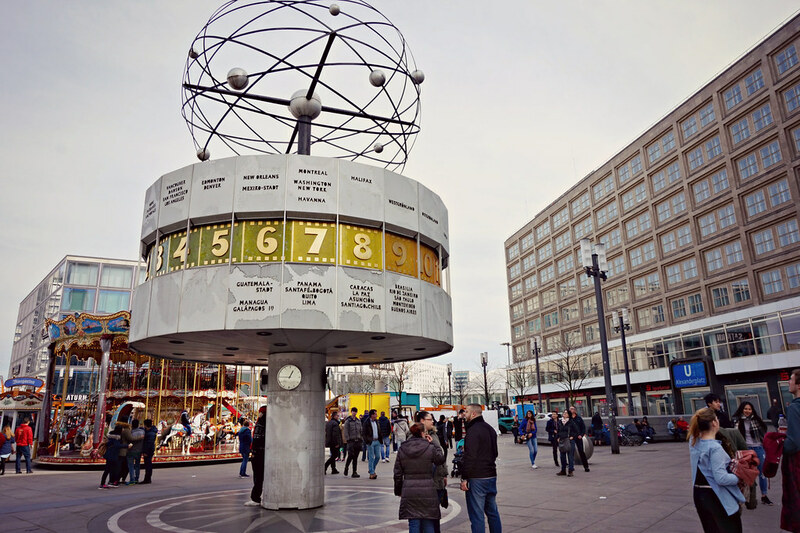 We went to Berlin at Easter time, despite not seeing as many signs of it as in other German cities or frontiers I thought the wooden stands I saw on Alexanderplatz were there for that. Apparently they are there always at least some of them which gives an interesting contrast to the square with its world clock and modern buildings around, these little touches of the more traditional German helps to complement it. Frequentado por Merkel e famoso também por aparecer no programa de Anthony Bordain, o Konnopke’s Imbiss foi dos primeiros que apontei no mapa a visitar em Berlim. A primeira vez que fomos estava fechado e a segundo lá conseguimos provar a sua famosa currywurst que seguramente em tempos foi considerada das melhores mas que agora está a ficar para trás no ranking. 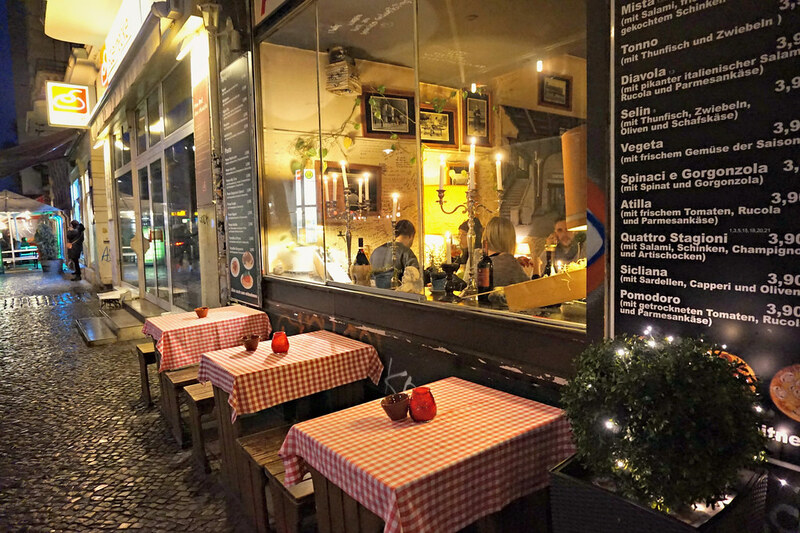 Frequented by Merkel and also famous for appearing on Anthony Bordain’s show, Konnopke’s Imbiss was one of the first that I added to the map to visit in Berlin. 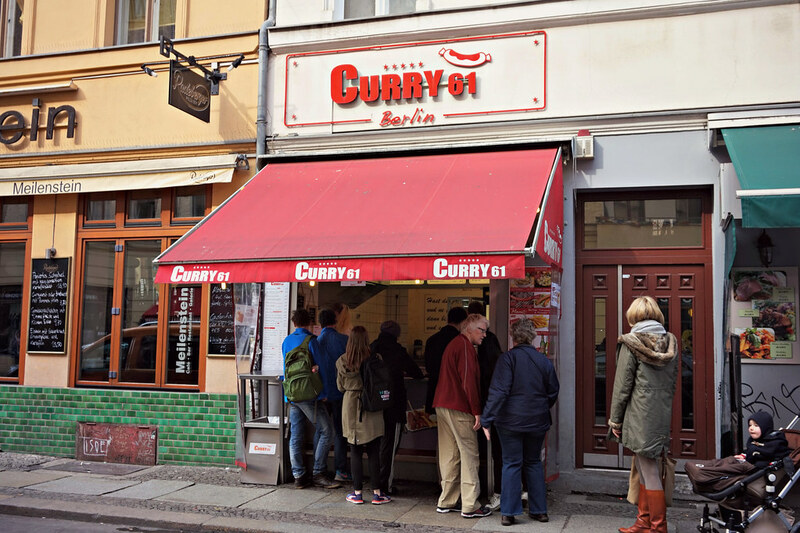 The first time we went there it was closed and the second we were able to taste their famous currywurst which surely was once considered the best but which is now lagging behind. 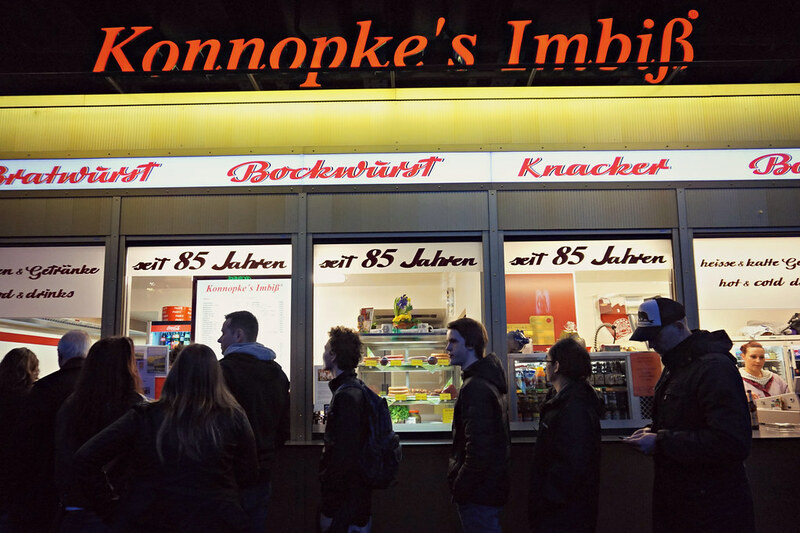 Jantar no Pan e Vino não estava nos nossos planos, fomos em busca do famoso currywurst do Konnopke’s Imbiss e estava fechado. Famintos e afastados do nosso hotel decidimos nir mais longe e encontrámos este restaurante italiano que pelas suas toalhas de xadrez vermelho e branco e cartazes com fotos das pizzas a preços a partir dos 3,90€ parecía um engano. Pelo contrário, foi uma agradável surpresa que cumpriu com dois dos três: bom, bonito e barato. Dinner at Pan and Wine was not in our plans, we went in search of Konnopke’s Imbiss famous currywurst and was closed. Hungry and distant from our hotel we decided to go further and found this Italian restaurant that for its red and white checkers and posters with pictures of the pizzas at prices from € 3.90 seemed a mistake. On the contrary, it was a pleasant surprise that it fulfilled with two of the three: good, beautiful and cheap. O primeiro dos museus da sua famosa “ilha” está desde 1830 num impressionante edificio neo-clássico junto á Catedral de Berlim. No seu interior uma grande colecção de peças de arte antiga da Etruria, da Grécia e do Imperio Romano. Foi dos mais fácil para entrar, tinha fila mas não tão desesperante como por exemplo a que se encontra no Pergamon. 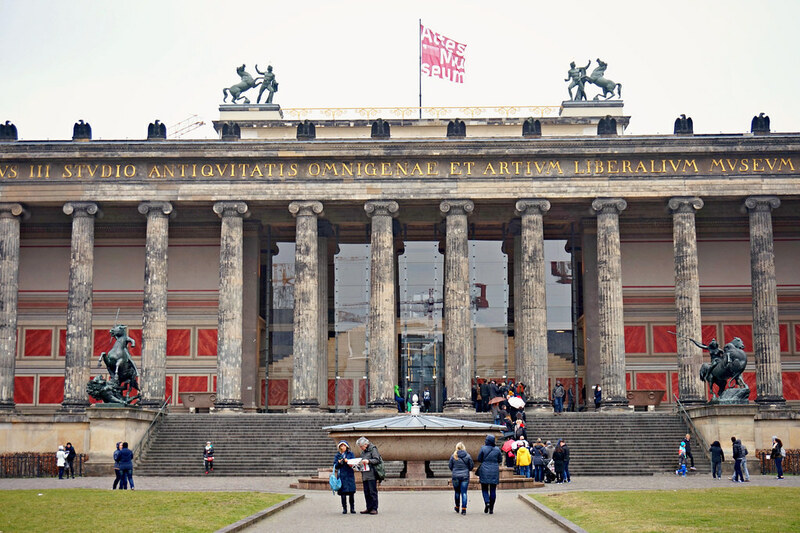 The first of the museums on its famous “island” has been in an impressive neo-classical building dating from 1830 near the Berlin Cathedral. Inside is a large collection of ancient art pieces from Etruria, Greece and the Roman Empire. It was one of the easiest to get in, it had a queue but not as desperate as for example the one in Pergamon.